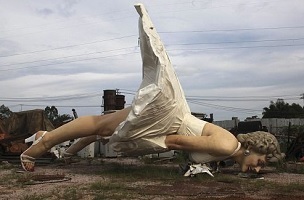 This giant statue of Marilyn Monroe‘s most famous film pose was erected in Guigang, China in late December 2013. And subsequently, virally consigned to the Chinese scrap heap in June, 2014. By our count, that’s seven months. And yet… This morning, there is a shocking paucity of “China Scratches Seven Month Itch”-style headlines. Even though the statue and mimicked over-an-NYC-subway-sidewalk-grate scene is from a film titled The Seven Year Itch. C’mon, media! Dumb puns are a digital media girl (and guy’s) best friend, especially in the crushing mobile heat of summer.